An employee handbook or manual serves as an introduction to the business, and a reference for any questions your employees may have. In addition to informing employees of their workplace duties, the employee handbook provides information on key policies, such as benefits, dress code, and work schedules. Once you’ve written your employee handbook, you’ll need an easy way to send it to your employees and keep it updated. Gusto is an HR and payroll software that lets you store employee documents that can be signed electronically for fast, 100% paperless onboarding. Start a free 30-day trial. Disclaimer: This article is for educational purposes. We recommend you always consult with a legal professional before finalizing or changing your employee handbook. Our handbook sample covers the basics you would want to include in your handbook. We picked these sections because, in general, they are valid for small business owners in all 50 states. However, this is a scaled down version of a handbook and you will want to add your own workplace policies (i.e. time off, maternity leave, sexual harassment) and check local laws (sick leave, commuter benefits) to make sure that your handbook is complete. Once you’ve written your employee handbook, you need an easy way to send it to your employees and keep it up to date. Gusto is an all-in-one HR and payroll solution that lets you store employee documents that can be signed electronically and downloaded, making onboarding fast and 100% paperless. Click here for a free 30-day trial. You have written expectations of an employee. You handbook eliminates the “I didn’t know” defense and gives you something to point to in case of employee policy violations. Including a statement of “at will employment” within your handbook further protects you in case of an involuntary termination that results in a wrongful termination lawsuit. This is a signed document that can help you if you ever need to defend yourself in a wrongful termination lawsuit. However, it’s not as strong as an employment contract, which may provide additional protections. When you have a baseline, like an employee handbook, you are able to start a dialogue when an issue arises, such as an employee who needs to take time off for a family member’s funeral. Also, the employee handbook creates some structure and gives clarity to policies, so that managers and employees are on the same page. Documenting something, like an expense reimbursement policy, makes it more likely that it will be followed by your team in the long run. An employee handbook also sets the stage for your work culture and employer brand. 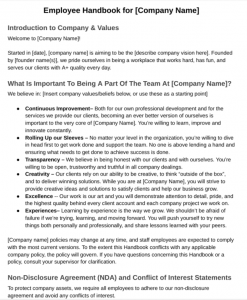 Introduction to Company & Values – Your company’s mission statement, why/how you were founded, and some insight into your culture can go here. Confidentiality & Non-Disclosure (or Non-Compete, depending on your business and location) – A non-disclosure agreement focuses on confidentiality, and a non-compete prevents terminated employees from taking your clients or starting a competing business. Most businesses, if they have those agreements, put them in a separate document and reference them in this section. Anti-Discrimination Policy – This is standard in every handbook and keeps you compliant with federal law (especially if you have over 15 employees). For example, your employees and managers should be reminded not to discriminate against individuals in any protected class, such as race, gender, religion, disability, marital status, or even sexual orientation. This includes preventing discrimination not only in hiring, but in promotions, training or any job related benefit. Employment at Will – This is where you’ll mention at will employment, which means employers are free to terminate as long as there’s no discrimination, and employees can leave without cause or notice. Compensation & Benefits – Everyone wants to know how they are paid and what benefits they will receive. Address the pay schedule and health benefits, retirement benefits, and other perks like commuter benefits in this section. General Employment Information – This makes crystal clear the probationary period (if your business has one) and what steps are taken if an employee wants to quit. Computers & Technology Policy – Many employees don’t know that if they sign onto personal email at the office, technically, you have the right to look at it. Tell them here, and advise them to keep personal and work separate. Leave Policies – Let employees know what your paid time off, sick leave, parental leave, and other leave policies are and what they can be used for, as well as jury duty and holidays (this will save you LOADS of time answering questions). Progressive Discipline Policy – For the business owner, this is a good section to lay out steps for discipline, and demonstrate your commitment to fairness. It should also make prohibited behaviors clear and reduce the risk of an employee winning a suit for wrongful termination. In it, make sure to include a reminder that at will employment remains in effect, regardless of a discipline policy. Signature Page – The signature page verifies that the employee received a copy of the handbook, which makes the employee take it more seriously and may help as a defense in case of a wrongful termination lawsuit. The sections above provide the backbone of a good handbook. The strongest point is that an employee handbook protects a business owner in hiring and firing decisions, as well as covers things like at-will employment, computer use, and confidentiality. Below are some optional items you may want to include depending on your culture, employee demographics, business model and location. Employee Benefits Policies If you provide benefits, you should list them and include how much you will contribute toward employee premiums. Details like the exact cost of a PPO versus an HMO are best kept in a separate benefits enrollment document. Work Schedules If you have shift work or set office hours, lay them out here. You might want to supplement with a policy on what is defined as being tardy and what is defined as leaving early. Also address your timekeeping system here. Break and Lunch Times It’s a best practice to document your break and lunch times, which aren’t mandated by federal law, but may be required in some states. Consider 10-15 minute paid breaks and an unpaid lunch break for full time employees. Employment Classification The Fair Labor Standards Act (FLSA) clarifies employment types, such as exempt versus non-exempt, part time versus full time, and 1099 statuses. You might want to include these definitions if you have staff who might not understand if they are eligible for overtime. Expense Reimbursement Policy If you have a lot of client outings or employees are constantly needing to purchase things for work, you’ll want a solid expense reimbursement policy upfront to prevent issues. Company Travel Guidelines If your team travels for work at all, outlining the policies such as mileage and per diem is a good idea You may also put in the policy if there is one person who should be booking the company travel, like the Office Manager. Safety and Security Do people sometimes come in early or work late? You’ll want to outline the business security system and lock up procedures in the handbook, as well as address issues such as what to do if the alarm system goes off. Ergonomic Setup Guidelines If you have a largely remote and/or sedentary team, ergonomic setup guidelines can provide them insight to prevent back, eye, and other issues that plague Americans and cause them to miss work at an alarming rate. Remote Working Policy Do you let people work from home or offsite? A remote policy will save you a lot of headaches in knowing if someone is online or offline and what you expect when someone is working remotely. Dress Code Even with casual dress becoming mainstream, outlining what is work-appropriate can be useful if you have a lot of young employees or if clients routinely come into the office. Alcohol Use Policy If happy hours occur often or you serve alcohol at client events, you’ll want to outline what is appropriate and what is not for these events. Weapons Policy Does your state allow open or concealed weapons? Your landlord may specifically ban them, as can you as the employer. You may want a policy to prohibit employees from bringing guns or weapons to the workplace. Marijuana and Drug Use Policy Many states have now legalized marijuana use, and some workers are prescribed medication for health conditions. You will want to have a policy to avoid workplace use of substances that can impair a workers performance, if you have an office or workers in the those states. Does your city or state require sick leave? New York does, so does California and Oregon. Is marijuana legal in your state? It’s legal in Alaska, California, Colorado, Massachusetts, Nevada, Oregon and Washington. Is it legal to carry a firearm in your state? Arizona allows concealed carry. Are their specific break and lunch requirements in your state? California requires two lunch breaks for employees who work 10-hour shifts. If you have over 50 employees, you’ll have to abide by the Family Medical Leave Act (FMLA). If you have over 15 employees, you’ll have to abide by the Pregnancy Discrimination Act. If you have over 50 employees, you will need to provide health insurance. Depending on both size and location, you may need a maternity leave policy. Do you have a lot of workers who are part time? If so, you may need to clarify how break, lunch and time off pay apply to them. Do you hire 1099 contract employees? If so, you’ll want to clarify what parts of the handbook, such as medical benefits, don’t apply to them. Do you have a lot of younger employees? You may need to be very specific about the use of mobile technology, such as their cell phones while on the job. Do you have many employees over 40? You may want to describe retirement benefits available to them. Do you allow employees to work from home or offsite? You may want to clarify how they are to stay in touch. These considerations may also affect you if your business has hourly workers that you need to provide overtime, or if you need to have policies based around alcohol at social events… a lot of things can come into play when you look at the demographics of your team. Do you need a dress code? Or do you trust employees to choose their own work clothes? Do clients come into the office or do people regularly meet them out for dinner / drinks? Does everyone at your company have access to social media? Do you want to encourage or discourage social media posts about company happenings? Once you have decided what sections you need for your handbook, use our free employee handbook sample and add on where necessary. We recommend you consult an outside attorney or Human Resources consultant to help you write your handbook policies and to look over your final draft. You can also find great freelancers who do this at a reasonable price! Here are the top 3 concerns and how to overcome them when you launch your employee handbook. Remember, the benefits of having an employee handbook far outweigh any of these concerns when implemented correctly. If you are implementing a handbook amid some chaos, which might be why you are doing it, be prepared to be a bit unpopular for awhile. However, the storm will settle, as long as your new policies are reasonable (i.e. getting expense reimbursements or break time under control are some popular reasons for an existing business to create their first handbook). To rollout the handbook, do something fun, like bring in bagels and juice for a breakfast meeting to explain and have everyone sign the handbook. The week after the handbook is implemented, have a handbook Q&A session over lunch and bring in pizza. A few weeks after, consider thanking employees for their cooperation with the new policies by having an afternoon ice cream social. Your managers need to lead by example and follow rules set out in the handbook in order for the rest of the staff to take them seriously. For example, if you own a cafe, and your manager is always late, but everyone else is now subject to a progressive discipline policy for being tardy per the new handbook, you might have some issues. Train your supervisors on the handbook and allow them to ask questions. Once everyone has understood the new policies, draw a hard line as a business owner. Be firm that this handbook applies to everyone, period. Here’s a sample non-discrimination training program you might use as a guideline for how to structure a simple training meeting. The handbook being in place means no playing favorites. Everyone deserves equal treatment, but you’ll need to make sure of this in order for the policies within your handbook to be taken seriously by the rest of the team. You as the small business owner and your managers need to uphold the handbook to the highest extent, and that means playing by the rules you set. Notice if there has been some favoritism or criticism going on that is unwarranted. Make an effort to rectify this as soon as possible. For example, if Jenny always gets to work from home on Friday, you may need to offer that perk to other office staff. Or if you as the manager often cross the line with inappropriate jokes, your employees may think that’s okay too. They’ll mimic your behavior rather than follow the handbook, potentially creating disciplinary havoc or even potential legal issues at work. You will want to hold a company-wide face-to-face (or video conference) meeting. An hour should be plenty of time for this meeting, and having snacks at the meeting can make the policy reading a little more palatable. Explain the handbook, answer questions about it, and then distribute it. You will also want to collect signature pages within 48 hours of this meeting and document them in personnel files (keeping a simple checklist with names makes this easier to track). You may also use an electronic signature platform, like SignNow. Some companies only have an acknowledgment form and leave it up to the employees to read the handbook. However, it is our best practice recommendation to have an actual meeting with employees, especially if you are a business like a restaurant, hair salon, or a real estate agency. Your handbook may provide details that differ from what is happening in the office, and you’ll need to be crystal clear that the policies have changed. Having a meeting is a better way to help employees take the changes seriously. One of the most important aspects of having an employee handbook is keeping it up to date. You need the handbook to remain current with federal, state and local laws. For example commuter benefits laws have been added in some cities like San Francisco and New York, so if you do business in those locations, you’ll want to add a section explaining how those benefits work. In addition, work practices change. For example, perhaps the management has informally agreed that employees can text in if they are sick. If your handbook currently says texting is unacceptable (like in our template), you will want to change your handbook. Gusto’s payroll and HR platform lets you to create, update, and store important employee documents that employees can sign online and download anytime. Gusto’s Concierge plan also gives you unlimited access to certified HR experts who can help you navigate HR issues. Try it free for 30 days. Step 1: Review the handbook. Review your handbook at least once a year to make sure that your policies are in alignment with the company’s norms and with your state, local and federal laws. If you need help on keeping up to date with HR law, SHRM is a great organization to subscribe to. They have an online blog, SHRM Connect and HR newsletters (you can choose to receive info only on the topics you care about). Or perhaps a better option is to work with an HR provider like Gusto that help you update your handbook annually. Step 2: Write up the change or new policy. Make the change in the handbook with clear, concise language. It’s not a bad idea to add an example. Then review the change with managers to ensure they understand and are able to answer questions or explain the change to employees. Step 3: If it’s a HUGE change… Have a meeting. For a large change, such as a change in compensation or leave policy, you will want to hold a company-wide face-to-face (or video) meeting. You will want to explain the policy, answer questions on it, and then distribute it. If it’s a very controversial policy, you may even have your employees sign and date that they received and understand the update and keep a copy of that signed document for your personnel files. Step 4: If it’s a small change, send an email announcement. For a small change or something that is more informal/already done (e.g. the texting example above) and just needed to be written down, send an email announcement to the entire team announcing the policy change and provide a Word or PDF copy or link of the latest handbook. An employee handbook is not a legal agreement. Whereas, employment agreements are legal and valid signed documents that can be upheld in court. They look very different than an employee handbook. Nonetheless, if an employee handbook isn’t written property, you may be creating an implied contract that violates the at will doctrine. Employee handbooks are useful to have since they not only protect the business owner, but they also provide a good baseline for employees to understand your company culture, what’s expected of them, and how things work at your firm. Having a good handbook can save you time, money, and headaches in answering employees’ questions. A well written handbook can also serve as a defense in case of a wrongful termination lawsuit. Don’t forget to check out Gusto, which integrates HR management, payroll, and benefits, and stores your employee documents online in one easy-to-use platform. Gusto even provides HR consultants to help answer your tough HR questions. Try Gusto free for 30 days. Do I need a lawyer to confirm the aspects of creating an employee handbook through this template? Thank you for sharing very useful article ! Thanks for reading Fit Small Business! We also have plenty of free downloadable templates. This helped me put together my office manual for class . It was a good example for me. Writing an office manual for a class is great practice for the real world. We hope you got an A! Hi Christy… thank you for putting this guide together, it’s very helpful. I’m a very small business that is growing and our company specifically employs adults with autism (developmentally disabled). We will be keeping our documentation and words very basic and easy for everyone to understand – but my question is… is there anything in particular we need to be aware of or put into our handbook for our unique population? thanks in advance. I recommend reading this article from SHRM (Society for Human Resource Management – the main authority on human resources) if you haven’t already. While it doesn’t explicitly mention employee handbooks, it does provide some advice about hiring employees with autism and the unique kinds of circumstances it entails. For example, one piece of advice is to make your policies clear and concrete. Avoid any figures of speech that might be interpreted literally, vs. rhetorically. Thank you Christy. This is such a handy material. I find it very useful. Keep up the good work. On behalf of Fit Small Business, thanks for reading! We’re happy to help. Set your employees expectations from their very first day working for you.